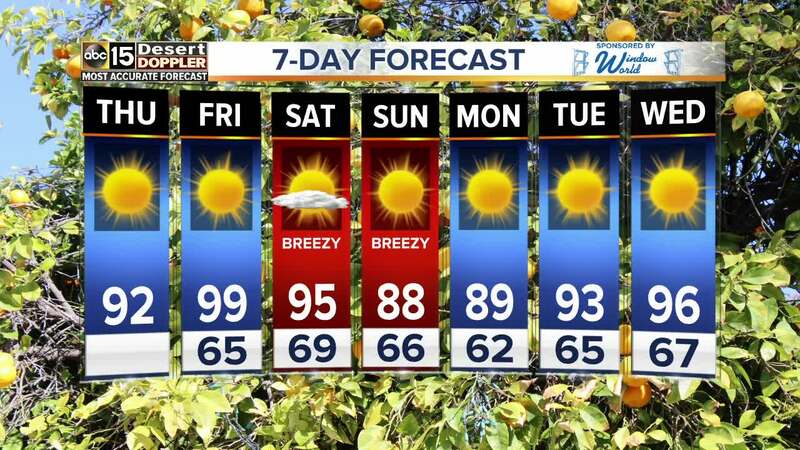 We'll top out at 99 degrees on Friday. High pressure is building in and really bringing the heat! The 90s are back today, with Phoenix reaching 92 under sunny skies. By Good Friday, we'll be flirting with our first triple digits of the year. Air quality will also be a concern by the end of the week as ozone concentrations look to reach unhealthy levels. An Ozone High Pollution Advisory is in effect for Maricopa county on Friday. So if you have any sort of respiratory condition like asthma or COPD, you'll want to limit your time outside or you could have difficulty breathing. Breezes will pick up over the weekend as another cold front moves in. This will improve our air quality and shave a few degrees off our highs through the weekend. Valley highs will fall to the mid 90s on Saturday and into the upper 80s for Easter Sunday. Then, we'll gradually heat thing back up again next week. Valley Average (Phoenix Rainfall Index): 3.79"